Learn how to apply the 2012 NFPA 101® to the health care environment with NFPA®'s classroom training. Review concepts then earn your Certificate of Educational Achievement* online. 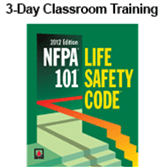 NFPA's classroom training helps you ensure your organization stays in compliance with provisions in the 2012 NFPA 101®, Life Safety Code®, as outlined by the Centers for Medicare & Medicaid Services (CMS) adoption of this edition. You'll gain a comprehensive understanding of the 2012 NFPA 101 as it relates to the health care environment along with key differences from the 2000 Code and their implications. Expert-led training addresses overall Code provisions including placement of equipment and furnishings in corridors, new provisions for patient suites, and expanded provisions for automatic sprinkler systems. Learn which sections of the 2012 Code are allowed for use by CMS, without the formal waiver process. NFPA 101, Essentials for Health Care Occupancies Classroom Training offers a Certificate of Educational Achievement* available through an online review and exam taken after the course. Earn the Certificate to demonstrate your understanding of the classroom training topics. Go online to earn your Certificate of Educational Achievement*! After attending the classroom training, review key concepts online and take the online exam at your convenience using the web link provided. You can prepare for the test in your own time frame, using online tools for review. Passing the exam will earn your Certificate of Educational Achievement*, confirming your course knowledge. *See the Certificate FAQs tab for more information on purpose, limitations of NFPA Certificates, and Course Objectives. Earn 21 hours or 2.1 Continuing Education Units for this 3-day Classroom Training. Attendance is required to earn CEUs. Please verify applicability with your professional board or organization before attending.